Assassin’s Creed Origins is out soon, but that is not enough for fans of the series, who are undoubtedly chomping at the bit to get their next stab of stealth action. After a break in the annualised release schedule meant the only Assassin’s Creed entries in 2016 was the film and the smaller Chronicles spin-offs, AC loyalists will notice that plenty has changed in this latest game as we head to the cities and dunes of Ancient Egypt. 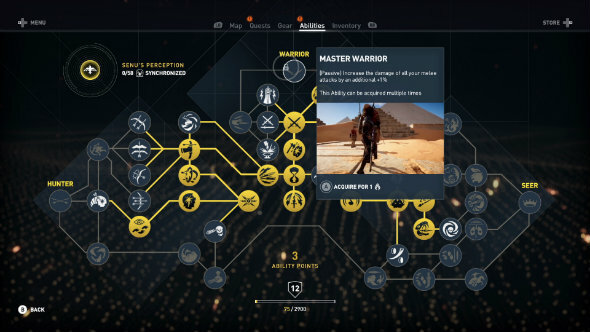 Related: Check out everything we know about Assassin’s Creed Origins. From the heady days of insta-fail and eavesdropping missions from AC’s past, Origins is binning pure stealth with a lurch towards the action-RPG genre. A revamped combat system ushers in hitboxes, striking, and dodging to an AC game for the first time, allowing greater freedom for players in their choice of playstyle. As Bayek of Siwa, you will be battling it out in gladiatorial arenas and infiltrating enemy outposts as you take on this game’s big, bad, The Order of the Ancients. 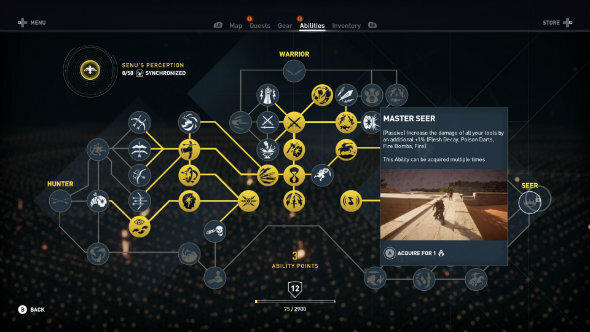 As expected from an AC game, you’ll need plenty of abilities to successfully carry out your mission, even more with than usual due to its shift towards action-RPG. Lucky for you, that’s where we come in: here are all the abilities within each of the game’s three classes – Hunter, Warrior, and Seer. The Hunter class is for those looking for a more traditional Assassin’s Creed experience. Hunter abilities boost your archery skills and impact your eagle companion, Senu, who scouts ahead to give you an idea of the lay of the land. Eagle Tagging:Use Senu in stationary mode to tag enemies and various points of interest in activity locations. Eagle Harass:While in stationary mode, look at an enemy and have Senu stun them. Senu also helps you harass enemies during combat. Bow Bearer:Equip a second bow. Arrow Retriever:Loot arrows stuck in your shield back into your inventory. Hunter’s Instinct:While in stationary mode with Senu, mark a civilian, enemy, or animal to see the path they are currently taking. Assassination Loot:Automatically loot an enemy after assassinating them. Assassination XP:Assassinating an enemy grants you bonus XP. Headshot XP:Killing an enemy with a headshot grants you bonus XP. Chain Assassination:After assassinating an enemy, throw their weapon at another target. Enhanced Warrior Bow:Charge your shot and reduce its dispersion zone. Enhanced Hunter Bow: Charge your shot and additionally break shield defense. Enhanced Predator Bow:Control a predator arrow in the air. Enhanced Light Bow:Increase stability while shooting. Elite Ranger:Aiming with your bow while in the air will trigger slow-mo. Bow Fury:After getting a stealth kill with your bow, you have a three-second window of slow-mo while still aiming with your bow. Stealth Kill Streak:Chained stealth kills increase the XP granted. Master Hunter:Increase the damage of all your bows by an additional 1%. This ability can be acquired multiple times. The Warrior class is tantamount to the ‘guns-blazing’ approach. If you want to get in your opponent’s faces armed to the teeth, throw your ability points in this direction. Overpower:When your adrenaline bar is full, unleash the power of your weapon. Every weapon class has its own unique ability. Overpower XP:Killing enemies with your Overpower active gives you XP. Overpower Chain Throw:After killing an enemy with the Overpower attack, throw that enemy’s weapon at another target. Overpower Combo:After an Overpower attack, chain with a combo of light attacks. Overpower Ultra:Double the damage of your Overpower ability. Weapon Bearer:Equip a second melee weapon. Charge Heavy Attack:Charge a Heavy Attack. A fully-charged Heavy Attack will shield break tower shields and knock enemies to the ground. Parry: Deflect an incoming attack while in shield mode. Regeneration:Your life can regenerate during combat. Attack & Push:After a light attack, perform a push attack combo. Extend Combo:Deal one more melee attack to an enemy before they can recover. Adrenaline 1:Your adrenaline is filled by +25% at the start of conflict. Air Attack:Perform an attack while in the air. Shield Charge:When locked on an enemy, run faster and bash enemies in your way. This consumes adrenaline. Kill Loot:Automatically loot an enemy after a melee kill. Adrenaline 2:Your adrenaline is filled by +25% at the start of conflict. Master Warrior:Increase the damage of all your melee attacks by an additional 1%. This ability can be acquired multiple times. The Seer class is a mixed bag, but it is mostly made up of barter abilities with some tips and tricks thrown in to give you a tactical advantage in a scrap. Call Mount: Call your mount. Smoke Screen: Drop this powder after melee attacking or rolling, stunning nearby enemies and creating a smoke screen. Smoke screens can break line of sight. Breath Holding Champion: Stay underwater longer. Dawn & Dusk: Sit, contemplate, and speed time forward. Sleep Darts: Throw these to put lower ranks enemies or animals to sleep and sneak by without being detected. Smoke Screen Damage: Enemies caught in the smoke screen will take damage and can be knocked to the ground. Fire Bomb: Throw these to set your enemies ablaze. Poison Darts: Throw these to poison and contaminate nearby enemies. Animal Taming: After putting an animal to sleep with a sleep dart, tame them to have them follow you. Berserk: Use this substance on a lower level unaware enemy and turn him against his allies. Flesh Decay: Infect a dead body and allow it to contaminate nearby enemies. Chariot Owner: Purchase war chariots from stable shops. Buy Materials: Purchase crafting materials from shops. Blacksmith and Weaver shops sell different types of materials. Salesman: Animal goods and trinkets can be sold at +25% price. Backstore: Purchase rare quality gear in shops. Tool Kill XP: Killing enemies with a tool grants XP. Tools: Flesh Decay, Poison Darts, Fire, and Fire Bombs. Master Seer: Increase the damage of all your tools by an additional 1%. (Flesh Decay, Poison Darts, Fire, and Fire Bombs.) This ability can be acquired multiple times. 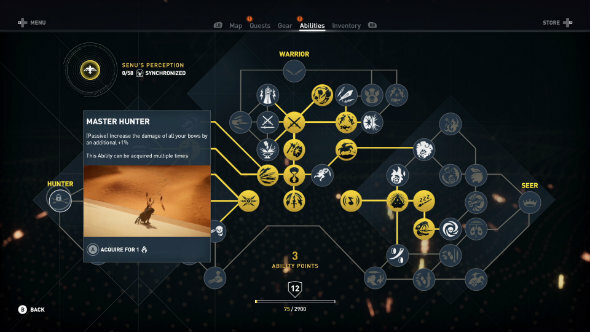 And that’s your lot where Assassin’s Creed Origins’ abilities are concerned. Are you excited for Assassin’s Creed Origins? Let us know the comments below.